A disgruntled customer, disappointed with the quality of pizza he received from Domino’s, posted acomplaint on LinkedIn last Friday. 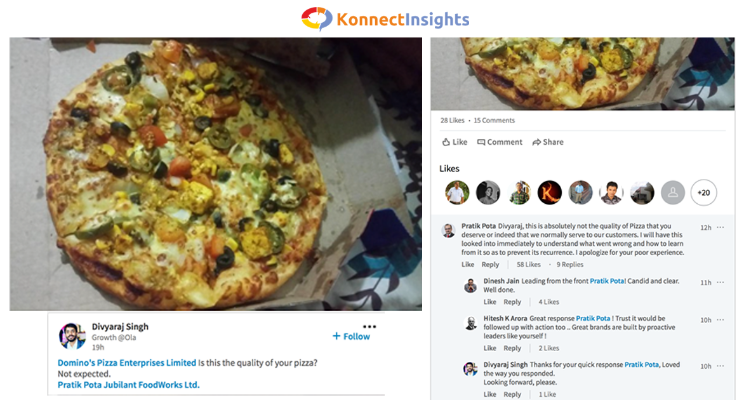 He did not just post the complaint but ensured he would be heard by tagging the Domino's Pizza Enterprises Limited corporate page and Jubilant FoodWorks Ltd page on LinkedIn. He did not stop there. He also tagged Pratik Pota, CEO of Jubilant FoodWorks, the company that operates Domino's Pizza brand with the exclusive rights for India. He writes “Is this the quality of your pizza? Not Expected”. You would think this is just another complaint. Many such complaint are dropped into the trash or ignored day in and day out. No CEO, with little to no space left in their calendars, would every waste their time to even respond to such a complaint. Many companies would consider it “very wise” to simply sweep it under the rug. To everyone’s surprise the CEO responded to this post. What is important to notice is the way he responds. Not only he leaves no scope for the customer to be angry anymore but also makes him feel thankful to receive such a quick response. Pratik Pota responded, “This is absolutely not the quality of Pizza that you deserve or indeed that we normally serve to our customers. I will have this looked into immediately to understand what went wrong and how to learn from it so as to prevent its recurrence. I apologize for your poor experience”. Kudos to the CEO. He takes it further and follows it up with another response when his team were unable to get in touch with the customer, “my team is trying to reach you, can you please SMS me your coordinates at 96548 33388?”. The post received many positive responses from other LinkedIn members appreciating the CEO for his candid response, proactivity and for being quick. This shows that the company has a well defined public policy and comment policy. Disgruntled customers are generally frustrated and looking to vent that frustration and be heard. When you appear as a person who cares enough to listen, they get most of what they are looking for. A connection to take them out of their predicament. And Pratik, leading from the front, gave the customer exactly that. We must learn from the CEO, how to take a negative feedback and convert it into a positive experience for everyone to appreciate.